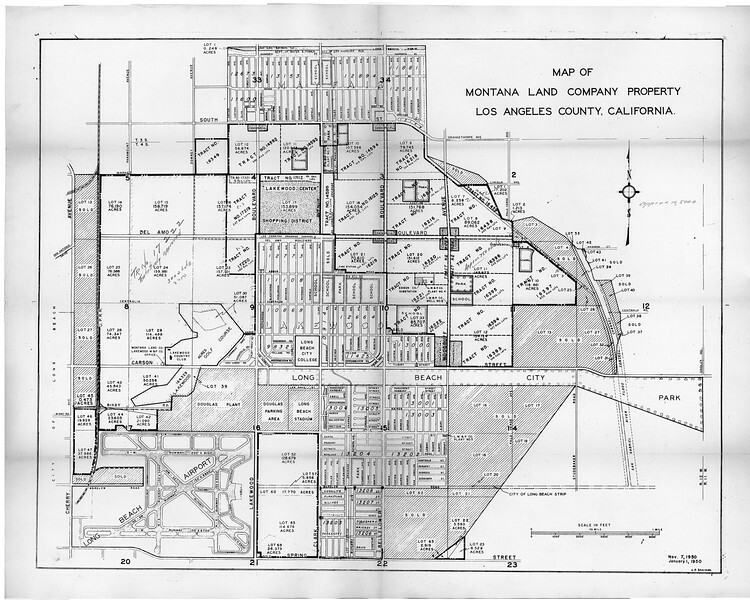 The Lakewood Park Corporation purchased the unbuilt acreage of the Montana Land Company in 1949. The map shows the 3,450 acres the LPC bought, as well as the parts of the Lakewood area that were already developed. To the north was the Mayfair neighborhood, built in the early 1940s for war workers at the Douglas Aircraft plant in Long Beach. To the south is the Lakewood City neighborhood, also a war-time development. The LPC purchase also included tracts below Harwell Park. These are now part of Long Beach. Most of what is now Lakewood east of Palo Verde Avenue was still agricultural land, including dairies and hog farms. New residents of Lakewood in 1950 complained about the farm smells that accompanied damp weather.